The Cheshire cat wears a shirt of sorts, his pelt, his fur is patterned. It cloaks him and makes him what he is, a Cheshire cat. Presumably if he were solid or piebald or some other pattern he would no longer be the mystical Cheshire cat and he could neither suddenly appear nor fade away into smiling, comfortable safety. The shirt protects him and defines him as it does for the English. The Cheshire cat, being a shirt wearing cat, is very smooth and cool especially with the ladies. He is around women all the time, talks about women all the time and makes Alice instantly comfortable even though one would ordinarily believe his supernatural appearance and disappearance coupled with his quasi-sinister behavior would cause anxiety. Compare this to the non-threatening White Rabbit, whom one would consider a solid societal pillar, yet he has problems interacting with or even recognizing those around him and constantly transfers his anxiety to others. He cannot even recognize the women in his life except for the Queen, and that is only because he is afraid of her. The Rabbit, it should be noted, although he does wear clothes, does not wear a shirt of any sort, unless his pelt is also a metaphor, and that is a basic white, which scores few points on the English shirt scale. The Norman Knights who invaded England set the manners and fashions for the Island. This included the mail shirt, made from interlocking iron rings sewn against a leather and felt background. At the time, the mail shirt was the ne plus ultra of Christian warrior fashion and although hot and heavy, it was a powerful status symbol. Even after the mail shirt faded from use, the associations of “shirt” with “nobleman” in England were solidified and the shirt grew in importance. But just how important did it become? The shirt is the English national dream; it is the landscape one sees out of a bedroom window on an easy spring morning, it is comfort, it is manhood. The shirt is central. I understand the Zulu consider cattle so vital to their culture that their language has over 300 words for different types of cow and hundreds more pertaining to its postures, habits and accessories. Their bovine beauty and the terminology associated with these Zulu cows are well written about in a fabulously illustrated book called The Abundant Herds: A Celebration of the Nguni Cattle of the Zulu People by Marguerite Poland and David Hammond-Tooke. For millennia the Nguni cattle and the Zulu people have been so closely intertwined that cattle have become an intrinsic part of the Zulu aesthetic. The same could be said of an English gentleman and his shirt. If English office workers were to inspire a parallel book by outside observers it would doubtless be about shirts. Let us now substitute the shirt as England’s Zulu cow. The English, like the Zulu, have many names for the different parts of a shirt. 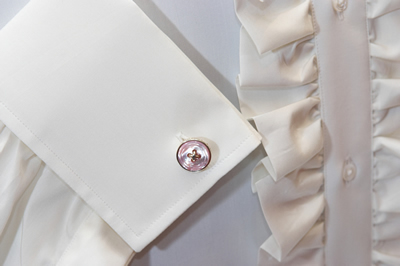 Designations such as French cuff, double cuff, turn back cuff, folded cuff, and link cuff are demonstrative of the shirt as a point of interest. And as with the Nguni people, from whom the Zulu descend, and who measure wealth in cattle, wealth for the English is measured in shirts. It is interesting that numbers of suits, ties, and shoes are unimportant but the shirt is self defining. It is held to be the key to the outfit. 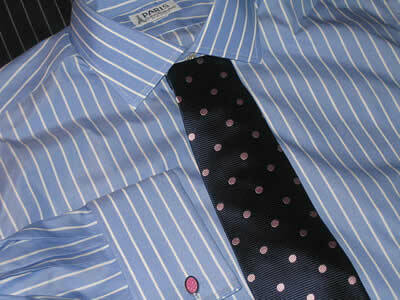 Owning different shirts changes ones mood or persona and to own many shirts is a sign of affluence and bonhomie. Additionally, suits and ties are worn as part of a uniform and discarded when no longer of use, while the shirt is revered more as it ages and is seen to imbue the wearer with status and poise. It would suggest that the shirt provides a connection between the wearer and the world around him and one which both eases him into the society around him and protects him like Norman armor. The English shirt is fine but it is also robust and hardy, which further mirrors the Nguni cattle breed, known for its fertility and resistance to disease. And like the English shirt, the Zulu cow was and is bred to best display the often multi-colored pelts considered the most beautiful among all cattle. Similarly, English refinement of blue dyes has spanned generations to achieve the exact combination of hue and brightness as well as importance and frivolity. This is because, like the Zulu cow pelt used by Shaka’s warriors to adorn their shields and headbands, the English shirt adorns the wearer’s torso and frames his face. The eggs of the lark – a creamy coat spotted with red brown speckles. These terms merely scratch the surface of a system of classification and cattle imagery which proliferates in Zulu oral history and poetry. 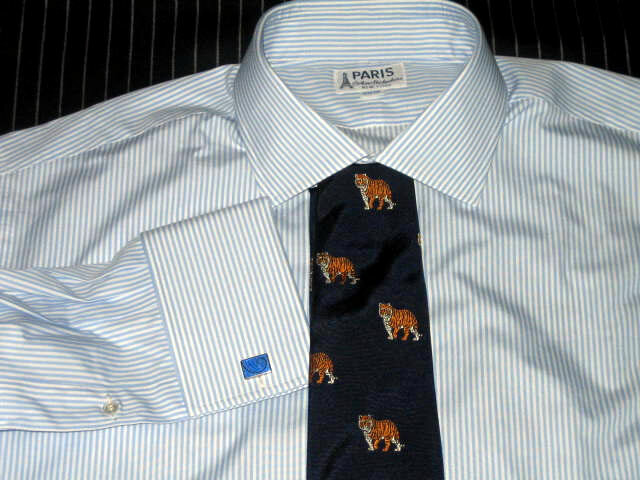 Bengal tiger tie: Although the English generally don’t like animals on their city ties, this isn’t necessarily the hidebound rule outsiders might need to make it. If the tie is ironic enough it might tickle the funny bone of an Old Boy. Consider the experimentation and refinements that led to all the shades and patterns of shirts the English hold in esteem. Compare these cattle images with ones of butcher stripes and Bengal stripes; gingham checks and jumbo checks; a dozen other stripes and checks and a hundred shades of blue all developed merely to dye cotton for a City worker’s shirt. Every pattern and color or color combination has a specific name the English will recognize; their shirts have been bred to perfection. The same shirt color and pattern lexicon does not exist for American men. Even though they often know more color shades, they have a harder time communicating a shirt’s appearance to one another. Just try explaining a butcher stripe to an American and you will see what I mean. The more I explore the English shirt, the more I find that it has more complexities than I hitherto believed. But there are parameters, there are guidelines, there are associations. I can see why an outsider would get it horribly wrong and why they would see classic English shirt choices as quirky. In America, either we have rules or we think anything goes. But England is more comfortable with itself; it understands it’s time honored traditions. America has not knit itself enough to see the richly woven tapestry that even the most unremarkable Englishman sees in Britain. By contrast, American culture is not settled. But because the clothes we wear were originally developed by the English, and they designed them in such a way as to be taken quite seriously while wearing them, we should, if we wish to understand and then alter them for our needs, heed the reasons they developed along the lines they did. It is fortunate for us that the genre has not yet been diluted, and it is curious to reflect that the English shirt entails a ritual that arguably traces its roots to the Anglo-Saxon huscarls and the Norman Knights who coveted their mail shirts. Other shirts skip around in the taste arena. Take the bright red butcher stripe. You can find this shirt on either the AA personality type city trader or on an aristocratic club-land denizen. Few others will wear this shirt. Why is it that two such disparate types, one rough and tumble with the reflexes of a famished tiger, the other as smug and idle as the Cheshire cat himself? The reason is the same but from different viewpoints. The shirt is aggressive and requires confidence to pull off. The city trader is essentially a warrior, while the club habitué frankly enjoys not caring what anyone thinks of him. The English consider the Butcher stripe, the Bengal stripe and the gingham check of varying gauges to be as invisible to the eye as plain blue and white are considered elsewhere. It should be mentioned that the English basically love stripes. Some checks have achieved the status of stripes in terms of cultural iconography, but generally speaking, checked shirts are a transient fashion. In a few years, apart from the classics, English people observing you wearing a checked shirt will simply think you neglected to buy any new shirts. Pink and blue on white is popular enough to cut across classes, occupations and generations. On the right is a classic “City lad” combination for a bright eyed trader and on the left are the accessories his more mature manager might wear. Note the placement of a red tie on a shirt with pink in it. American men would avoid this because they are influenced by the color dictates of the fashion industry whereas the English are either oblivious to them or delight in a clash of colors to underline that no thought went into the combination. As James Darwen, an English journalist, wrote in his book Le Chic Anglais, to satisfy eager French appetites on the subject, the building blocks of the English shirt wardrobe are essentially white, blue and pink (with “pink” meaning anything from a baby to a bubblegum to a salmon and including also what Americans would consider lilac and lavender). We might add to that tri-color palette bright red and purple, which provide an occasional bit of shock, and yellow, which can provide an accent (but not too much, lest people tease you about a yellow stripe of cowardice). Different colors are acceptable for after hours or in the country, but this is the subject of a future essay. As a matter of fact the colors for actual country shirts often change to those very colors unacceptable in the City. For after hours, just about anything goes, and the drive to be different can produce some bizarre choices. The most conservatively dressed city worker can wear some strident shirt choices for a soiree. Paisley shirts, shirts with day-glo stripes — yellow next to brown, orange and lime green on a black background — you name it, the English will wear it to a private party or one of the local watering holes. The English treat their shirts with the same reverence many Americans reserve only for their suits. Perhaps this is why suit materials tend to be beefier; the English believe they should take a pounding like a postal uniform while a shirt should be pampered. The Jermyn Street shirt maker, seemingly around since the Norman Conquest, focuses primarily on the English classics. OK, they aren’t really quite that ancient, but it will be remembered that the Norman Knights considered shirts of mail to denote the status of gentleman and to display wealth and power. And though, while the English centuries passed, the shirt changed from rings of iron to woven linen, silk and ultimately cotton, it remained the central indicator that separated gentle from serf. New & Lingwood caters to quality. New & Lingwood are a favorite shop for the Eton set (many of whom are descendents of those very same mail shirt-wearing knights) who continue to wear their goods after graduation whether they become mandarins, barristers or loquacious City lads. According to Mr. Sumrie they (both the shop and the English generally) prefer a full cut, which, in Jermyn street terms, is the standard approach of moderate room tracing the lines of the body, neither fitted shirts that go on like a water balloon nor sacks without shape. The English also like particular construction details in their shirts. The same collar shape has been retained for the past 15 years. The English get comfortable in their style and if they wore something in their first job, they want to find the same thing. It would actually cause an uproar if there was too much of a change(or any at all). A certain collar with a certain spread, length of points and height, of which no one can recall the origins, has been settled on as the national collar of choice. In fabric groups, Poplins: The English like white, a wedge (on the darkish side. 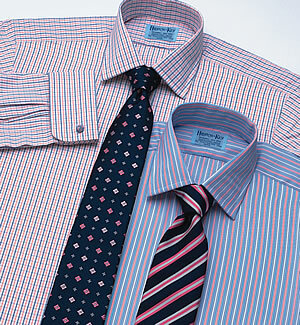 One is featured on New & Lingwood’s website) blue, a sky blue and an “English” pink, which are by nature classic. End on end fabrics, woven to apprear mixed with white thread in both the vertical and horizontal, particularly in pinks and blues are popular. Also popular are very fine stripes and Bengal stripes (about 1cm in width on a white background) in blues, pinks, bright reds, burgundies (wine, not oxblood). Green and grey and black are out and purple begins to encroach on the fashionable. The butcher stripe is a bit passé. White and blue and pink solids will never go out of style. The blue most chosen is generally on the “sky” side of the shade. Oxford cloth is popular for casual but not with suits. The English love this material for cords and a tweed jacket. It is one of the few shirts they will pair with a button cuff. Royal Oxford is just not that popular. The English like smoothness for dress shirts and texture for casual, whereas the grey zones in the middle aren’t all that popular. Twill weave is popular in a 100s 2 ply in white, blue and pink solids with the occasional Bengal stripe or gingham check seen, mainly in blue and white combinations for this twill quality. Small scale herringbone designs are very well liked; mostly in pink, white or blue. Pink and blue, light blue and dark blue stripes on white. The entire ethos of this “classic” style is about eschewing ostentation and not being noticed, or at least not being obvious. So though you may not want to blend in, you certainly want to be understated and have people discover your style as opposed to slapping them across the face with it. Yellow in solids or as a background color is not popular, to say the least. Green and orange are difficult shades. Grey and black patterns and solids are generally out, although the occasional black stripe will get picked up for dramatic effect with a black suit. Eccentric but English? The focus would be on non-visible parts of the garment. For example consider a somber charcoal suit with a cerise pink lining instead of the standard grey, or better yet, printed tie silk used to line the underside of the jacket’s pocket flaps. Contrast one (just one) of the buttonholes on the sleeve; something which doesn’t take over the garment but makes it slightly different. That’s for suits. 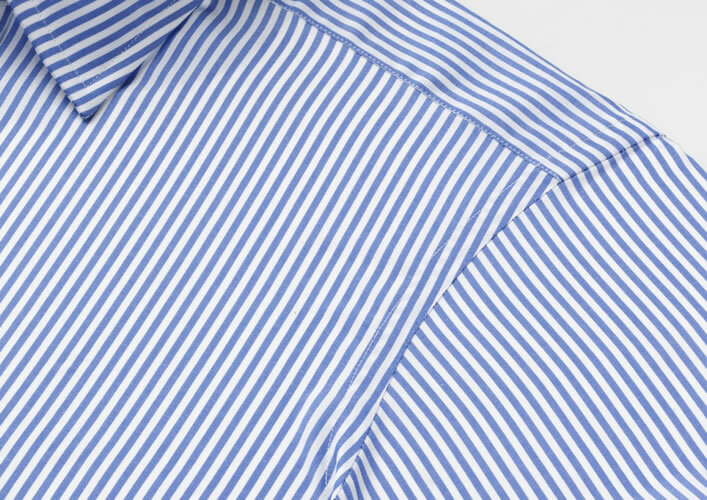 For shirts, take a striped or checked body (or even a solid) and put a much lighter version of the same cloth for the collars and cuffs. This would be something an English dandy might do but probably a bit extreme for standard city wear. It is still more popular to put the checked version of a striped material on the lower outside part of a double cuff. When the cuff is folded over, the inside of the double cuff shows a hint of the slightly differing material, which creates the sort of subtle eccentricity more mainstream Englishmen can wear. One could even line the inside of the shirt collar with the checked material as well. Other details are the bottom buttonhole of the shirt (unseen when tucked into trousers) might be horizontal vs. vertical or in red vs. white, or the side gussets (again unseen when the shirt is tucked in) done in pink or turquoise. Apparently just knowing that something is different, even if no one else does, provides satisfaction enough in Albion. 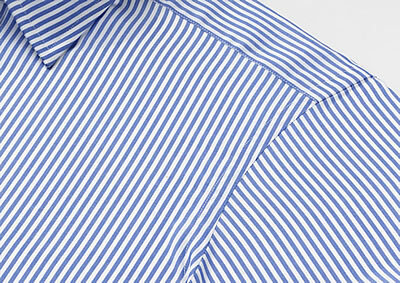 Englishman love blue stripes on a white shirt, and the Bengal stripe in particular, which actually derived from their time in India. Apparently the pattern, modeled after a tiger’s stripes, was native to India and used for all manner of cotton clothes. In fact, cotton itself as a material for shirts came from India and the Middle East, replacing European linen for men’s shirts. In any case, the blue stripe on a white background (even the white stripe on a blue background) is a favorite that the English never tire of. The sheer number of variations on this theme is staggering. Only the slightest variation in a blue Bengal stripe, undetectable to an innocent bystander, is enough to satisfy a Londoner that he has something unique. There was a time (circa 1900) when men of means got nothing but custom shirts. Ready made shirts evolved because whenever a shirt was made for a customer, the shop often made at least one other that the customer hadn’t ordered because it was cost effective. When another customer enquired about shirts, the shop staff would look through their accumulated stock of shirts for other clients to see if one approximated his size and shape. If one did, it was tried on him. Repeating this custom over and over gave the English shop keeper an idea of the variations in a man’s body, which led to standardized shirt patterns. Apparently this was once the same for ties. Ties were all made for customers. There is no way you can make just one tie from a length of silk, you have to make two (assuming thrift), and so two would be made up and the second placed in a drawer. Shirts were made with separate stiff collars, which made laundering easier. After a while, everyone realized that shirt bodies could stand regular washing and so attached collars made sense. White is the top seller with blue a close second. 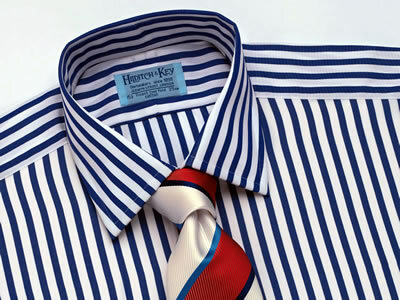 Most bold shirts are window dressing “hooks” which get people interested in going into the shop. Americans wear very bland shirts. You’ve got your whites and blues. Bold stripes like those worn in Europe have not entirely caught on here yet. Although during periods of affluence, brighter and bolder shirts sell better everywhere. Americans like brown/beige patterns or stripes for office wear . These are colors that the English agonize over making in business quality poplin cottons. 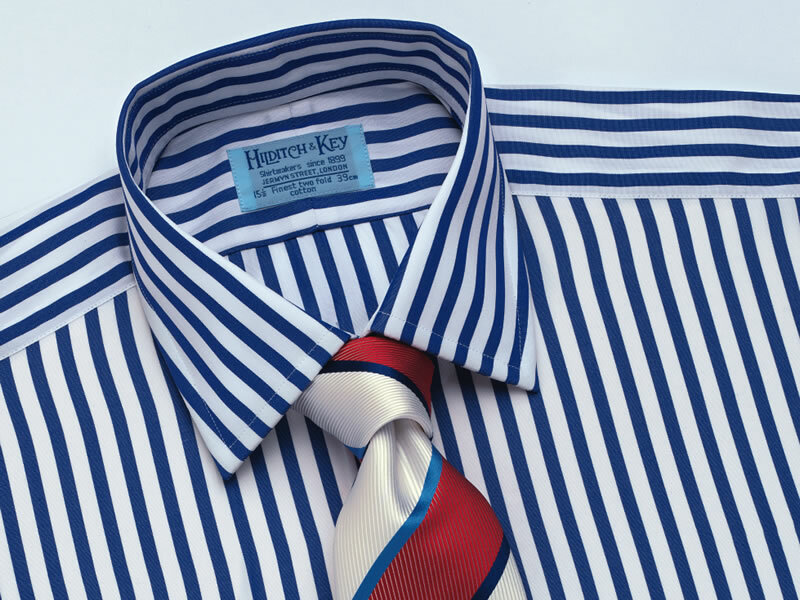 Multi stripes are an English passion, particularly a blue background with blue and red stripes on it. The weather is so dreary in London that the shirts are a way for men to brighten up their day. Checks were rarely worn for business, but the designers have shown how checks with suits for work are acceptable, demonstrating that even the English are not immune to the designer’s marketing efforts. French cuffs, called double cuffs in England, actually did originate in France. Gentlemen there were very well turned out and wore long frilly cuffs under their jackets but turned them back in order not to stain them during sword duels. The protective convenience became a style in itself. In England, men like French cuffs because they can show off their cufflinks, which are an important masculine accoutrement. The English like a cutaway collar or a modified spread collar. Button downs are slow to catch on because the English have trouble copying that American roll, which is necessary to make the shirt look casual. Pin collars were also an American import and were a fad in England decades ago, but the English don’t like them so much anymore. If a movie comes out that features them, there will be a surge in demand for a while, but everyone eventually goes right back to the spread collar. The Duke of Windsor wore his own specific design of cutaway. The Italians have since lent their name to the collar the Duke invented. 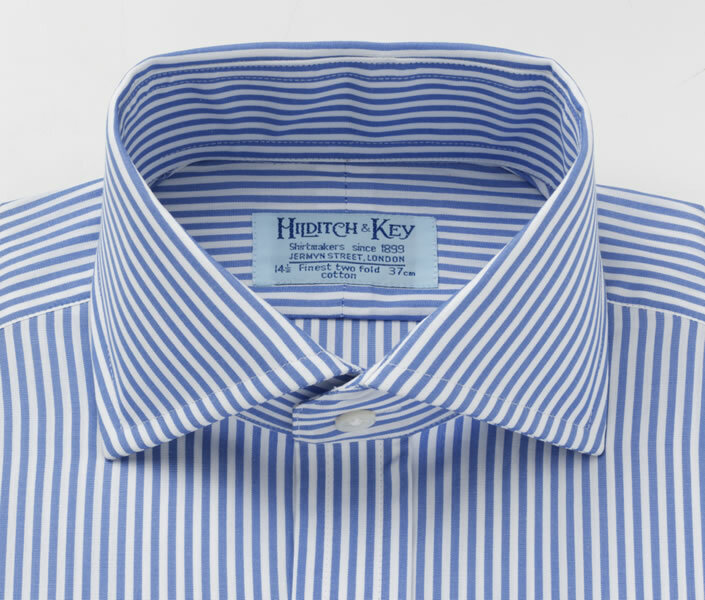 Not only is it an English collar, but it was also designed and made for the Duke by Hilditch’s Paris shop. 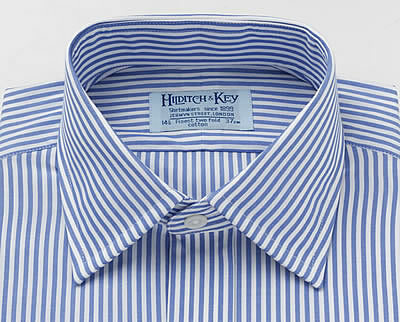 It is still available from Hilditch under the designation “cutaway” collar. The English like a wide variety of fabrics for shirts, though for business they prefer the smooth poplins. Voile is not that popular because England is not a hot country. Voile is mainly used for dress (black tie) shirts. Collar stays made out of brass or sterling are nice, but they are expensive and, if left in the shirt, sometimes do not come back from the laundry. They were called bones because at one time they were made of whale bone. Now that the whale is protected and the metal ones will get you into trouble at airport security, plastic are the ones to use. They can be cut and reshaped to suit a particular collar, but if left in a shirt collar they will be destroyed by a commercial laundry. White collars and cuffs are more common with the English than the Americans. The English keep their jackets on more, which, in turn, keeps their French cuffs more hidden and cleaner. There is also that attachment to their cufflinks. The Americans prefer a self cuff because they automatically remove their jackets and consider the white cuffs a bit too flashy. 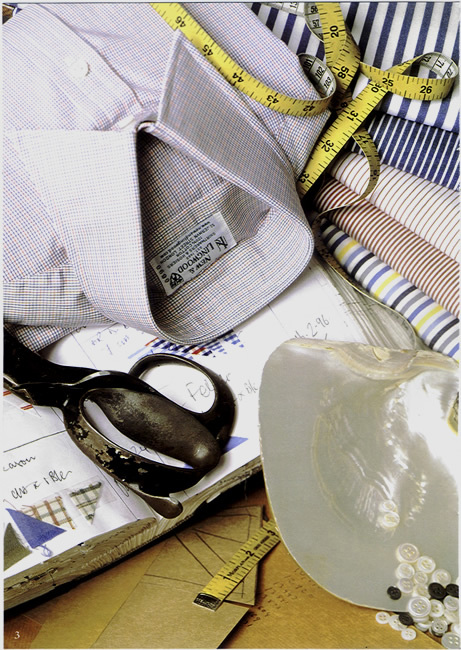 Turnbull and Asser have a very English ethos, slightly different but still part of the national sartorial tapestry. Everyone who’s anyone and who’s English has at some point shopped here. Lawrence Olivier, Charlie Chaplin, Winston Churchill, Peter O’Toole, Ronald Reagan. When you first walk into the shop you are overwhelmed with color, and the idea is to celebrate both the proper and the individual. It was founded in 1885 and moved to Jermyn Street in 1905. And Turnbull has always had this love affair with color. The Edwardians and Victorians were wearing a more colorful selection of shirts than is probably believed today. Black and white photos do not do them justice, but Turnbull’s archive catalogs this celebration of the English style. Striped collars and cuffs with same color ways fabric but checked bodies are very English, but only worn by their most assured and individualistic dressers. To sum up, the fabric of the collar, cuffs and front placket would all be striped and then the identical fabric in a check would be used for the body. The Englishman is very much married to his shirt. 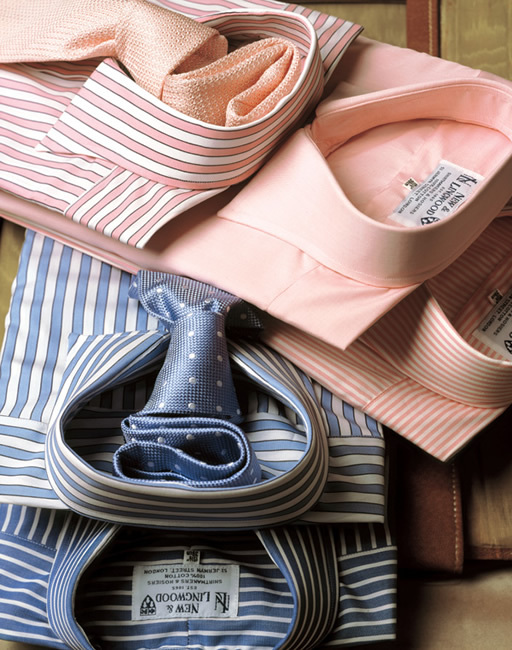 Shirts have a status in the Englishman’s closet that other accessories don’t possess in his mind. There is currently a revival in England for custom made shirts and English men are indulging themselves. 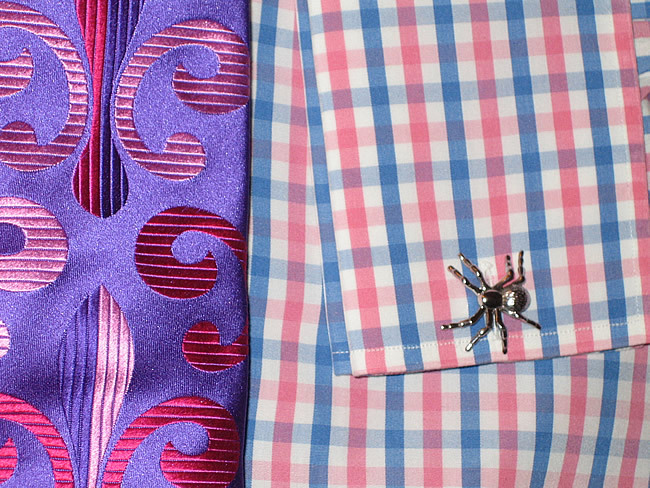 Turnbull and Asser shirt: A fun retro style dinner shirt. This shirt is a knowing salute by T&A to swinging London of the 60’s and 70’s era. Turnbull makes all their own ties by hand in London. They are designed and constructed to fit in with the Turnbull vision, which is a Very Jermyn Street, City of London vision. Some of the shirt patterns and colors that Turnbull offers are so incredibly mad that only the English will wear them to compensate for their absence of noon day sun. Yellow and green are not popular. Red on white in different scales, red on blue; both in checks and stripes are quite popular for the English Turnbull client. The English just like red. 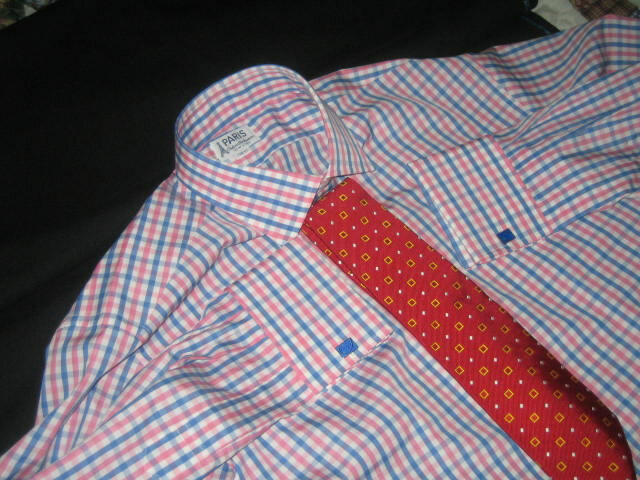 One client wanted collar and cuffs that were detachable and interchangeable for all of his Turnbull shirts. Turnbull devised a system of buttons and loops that would secure the collar and cuffs to the shirt body and sleeve ends — something like 24 buttons on the collar alone! It was rumored that the ladies sewing the shirts were impressed but not amused. Back-to-front shirts have no placket or opening in the front and literally button up the back. Hidden, secret, mad and all very English. Turnbull keeps thousands of fabrics on hand because they know their customers all want something slightly different. 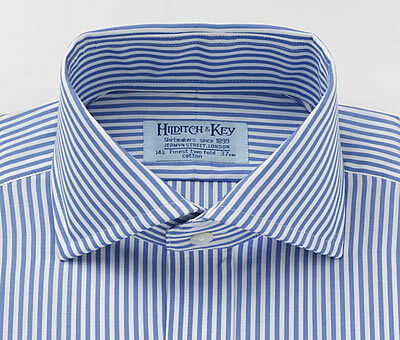 The shirt they would stock most of if they knew they had to sell their entire stock in a day to Englishman would be a mid blue hairline or mille raie stripe, which would look like a solid from a slight distance. The English enjoy a shirt that looks like a solid at a distance. Spread collars are the favorite. Partly because the English like heavier weight silks and thicker knot styles in ties. Pinned shirt collars are very American, very Brooks Brothers. And although pinned collars are considered smart by the English, they are far too idle to bother with something requiring so much effort. The English love double cuffs. 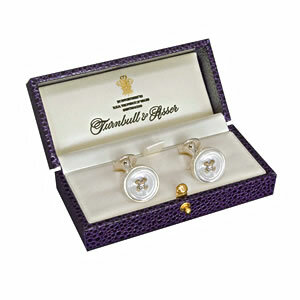 To adorn these, Turnbull sells a house style cufflink that is a mother of pearl button mounted on a sterling background. Mr. Lowe-Mackenzie recently saw tiny little 18k gold Chinese style horses with tiny diamond eyes on a chain link. A little bit fey but absolutely elegant amongst the well dressed set. He is wearing Asprey cufflinks with little frogs on lily pads. The focus is tongue-in- cheek, or in the case of a pig’s head cufflink, apple-in-mouth. That sort of whimsy is de rigueur in England. Braces in bright or pastel colors are a Turnbull, and an English, classic; another bit of subversive fun for the City dresser. Most men wear belts with their suits now. The full bespoke shirts take about 3- 4 weeks to complete the first shirt and then another 6 weeks to deliver the balance of the order. They have two teams of ladies, one of whom does all the ready-to-wear and another who focuses on the custom orders. The same workmanship is expected throughout. At this point, it should be clearer why the English have a Jermyn street tradition that deals in shirts. Because the English form attachments to their shirts, they put more effort into their selection than any other item in the wardrobe. 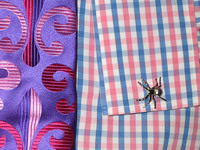 Shirts are cared for and worn with pride as a symbol of wealth, status and power in a manner similar to that a Zulu farmer might display his prize cow. Because of a continued dedication to excellence, the English have perfected their shirts in much the same way the Zulu perfected their cows and for similar reasons. Namely that the shirt, like the Zulu cow, is designed to best offset the colors most attractive to and most flattering for the natives. But what does the future hold for the English shirt? Will its language endure? Will its patterns and colors remain true? If there is an irony at work here it would be that while the Italians produce all sorts of cottons for export to the USA, they hanker after the English selections of Acorn fabrics (English owned and designed) and Thomas Mason (Made in Italy but, for the moment, still directed by English tastes). Americans love both the Italian and the English, while the Italians love the English. I do not believe we need to choose one over the other, but at least separate in our minds which is which and avoid wearing Italian shirts thinking they are English or vice versa. And as with anything scarce and beautiful like the Nguni cow, there is a chance that English tastes will disappear from a lack of tasteful breeders. Things are generally beautiful because they are scarce, delicate or perishable, but there is always room for change. Even Edmund Burke would agree that there must be some, even if it is slow and only references the past. However, although new colors and patterns in shirt cloths that appeal to the English might appear, people who do not understand English tastes may try to emulate them without fully understanding the rationale behind their choices and fail to get it quite right. This could cause the so-called lethal mutation that would transform elegant simplicity into something appalling. But as long as there is an England and the English celebrate their tastes, and as long as admiring outsiders herald the same, the Cheshire Cat’s grin will hang forever in mid-air, the Zulu cow will always be the most beautiful, and the élan of the English knight will continue in the modern-day gentleman warrior, in his shirt if nowhere else. H. Lesser and Sons London Life: WestEnd Style (Part One).